The Marvel Experience, produced by Hero Ventures, is the world’s first hyper reality roadshow where guests can join the Marvel Universe rather than passively watching it. 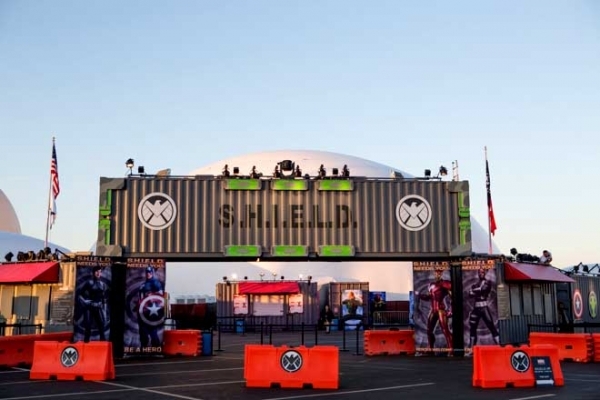 Encompassing a 2-acre complex of more than 80,000 square feet, the Marvel Experience resembles a temporary S.H.I.E.L.D installation or “Mobile Command Center” with an apex soaring more than six stories high. Seven colossal inflatable domes house a labyrinth of next generation interactive technology created by numerous partners which include: a life size Avengers Quinjet, the world’s only 360 –degree, 3D stereoscopic dome attraction, a state of the art 4-D motion ride and a plethora of interactive games, making the experience a must see for Marvel fans of all ages. “This Marvel experience employs new technology and new concepts that we think will make this one of the most exciting shows ever produced. It will be a truly unique experience,”–Michael Cohl, Marvel Experience Executive Producer, in a Marvel Experience press release. The Marvel Experience is a touring interactive roadshow packed with multimedia content and interactives. 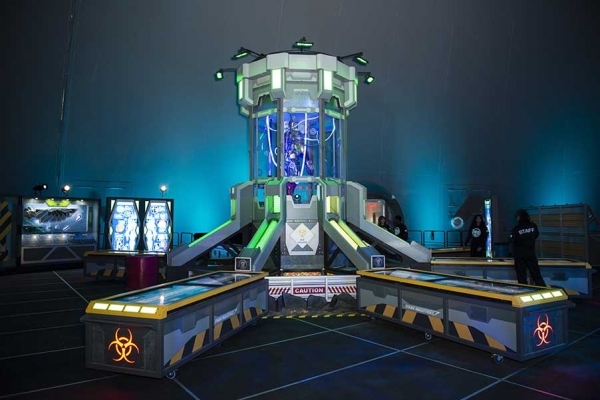 For the project, Unified Field worked closely with the Hero Ventures team to develop 5 iconic interactive experiences: the Avengers Augmented Reality Wall, the Super Adaptoid Recovery Multi-Touch Table, Iron Man Flight Training, the Spider-Man Climbing Wall and Hulk Out! The Avengers Encounter Augmented Reality Wall enables up to three visitors to summon their favorite Marvel Avengers by striking a series of superhero poses. 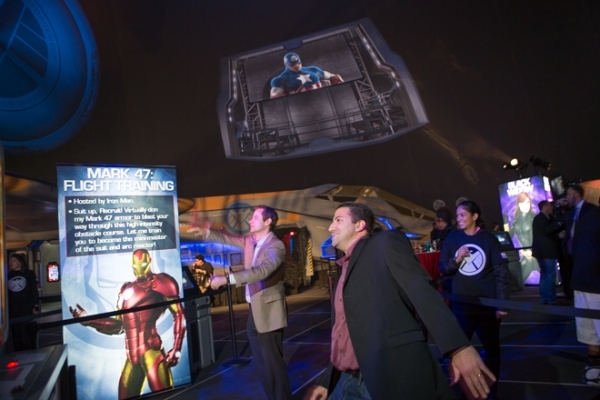 Projected onto the ceiling of the main training dome, up to three visitors can use a series of unique body gestures to call up life-sized interactive 3D models of their favorite Marvel Super Heroes such as Captain America, Spider Man, the Incredible Hulk, Nick Fury, Black Widow and Iron Man. The gesture sensing interactive has already proven to be one of the most popular interactives among fans. When the correct pose for a character is struck, the moving superheroes repel, fly and jump into the projected image on the dome alongside guests, giving the appearance that the superheroes are standing next to visitors for a dream selfie. 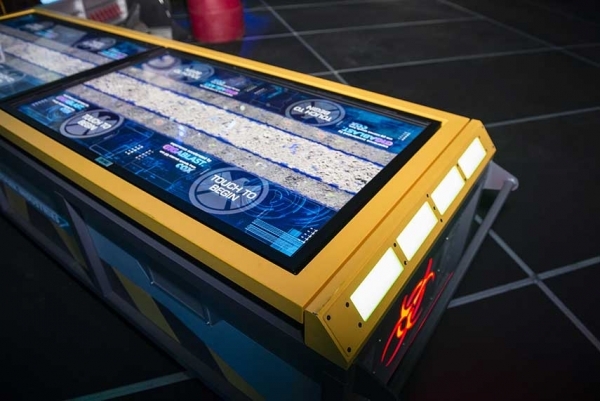 The Super Adaptoid Retrieval and Containment Unit is a breathtaking array of multi-touch tables. A hub of seven CyberTouch 55” multi-touch tables surround a partially assembled Super Adaptoid robot, a race of intelligent androids that can adapt to the hero’s powers, locked away in a Plexiglas containment chamber. In this Tetris-like puzzle game, up to eight guests can stand at one multi-touch table where they dig through a conveyor belt of digital dirt in order to unearth pieces of the villainous Super Adaptoid robot. As guests find components of the robot such as: weapons, armor, or memory chips, they drag the item to their station where it is magnified for analysis. When pieces are correctly assembled, the parts are sent to the containment unit to reconstruct the Adaptoid. Properly assembled pieces trigger show controls which start a light display inside of the containment unit. Unified Field created the Super Adaptoid multitouch table. At the Marvel Experience guests can experience the thrill of becoming their favorite Marvel superhero through the use of our gesture recognition simulations.In the Iron Man Flight Training simulator, visitors suit up and fly with Tony Stark through a desert canyon obstacle course. The simulator allows up to two guests to stand in front of monitors with an animated avatar of themselves suited up in a Mark 47 Iron Man suit. Using gesture sensing hardware, the program detects the player’s skeleton and position at each of the screens. The two stations will operate separately from each other, allowing guests to start their own flight at any time. Guests use their bodies to control turning and speed as they navigate a treacherous desert canyon racecourse, trying to avoid colliding with the rock walls. Our Iron Man Flight training gesture simulator lets guests fly through a desert obstacle course. As they fly through the course, visitors will be tasked with tight canyon turns and attacking training drones, which players must blast with their arm gesture controlled repulsor beams. When players thrust their arm out, the beams fire to stop obstacles that blocking the flight path. The scores from the stations can be pooled to show the high scores from all stations. In the Hulk Out! gesture based simulation, visitors take control of an Incredible Hulk as they smash and jump their way through a series of training drones. 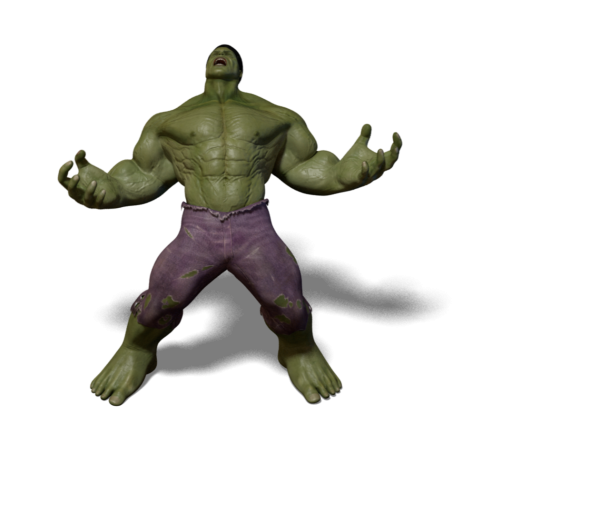 Visitors’ real time punches and movements are captured and translated into movements in the game, while the Incredible Hulk leads the guests in an exercise to practice the power of their punches. In this timed experience, up to 4 guests smash their fists as hard and fast as possible to fill their power bar. When the power bar is filled, the Hulk then unleashes a special move, the thunderclap. When the time runs out, guests will be awarded points based on their accuracy, power and speed. The guest controls the Hulk’s arms as they swing and punch oncoming drones, being careful not to smash green “friendly” drones. A Guest’s score is composed of objects smashed and avoided. It starts slowly, but the pace increases throughout. The guest has 90 seconds to smash as many objects as possible. If you’ve ever wanted to climb buildings with Spider-Man, then the Spider-Man Climbing Wall is the chance of a lifetime. 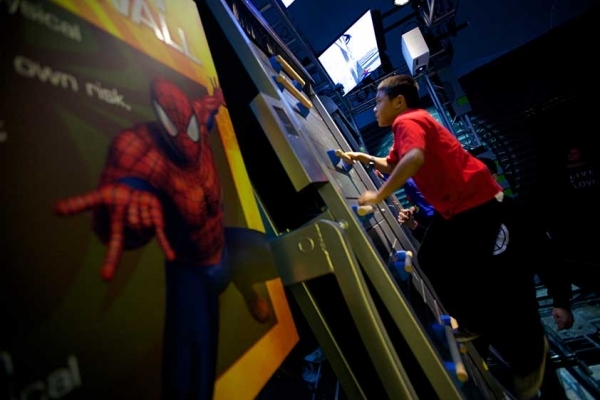 The Spiderman Climbing wall provides a safe yet thrilling activity for children and adults alike using a state-of-the-art Tread-wall vertical rock climbing treadmill. The Spider-Man Climbing Wall invites guests to scale a “virtual” wall alongside the Amazing Spider-Man, while chasing Venom up the side of a virtual skyscraper. 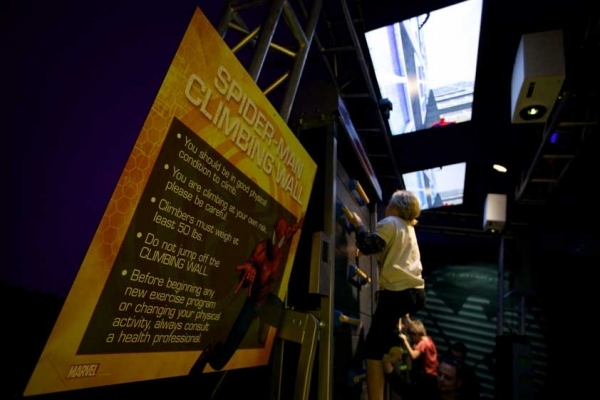 In this interactive, guests climb up the tread-wall while they see themselves on monitors above their heads virtually climbing alongside the animated Spider-Man as he shouts encouragement. A monitor situated below the guest simulates a city street that gets smaller and smaller as the visitor climbs towards the top of the building. As the guests begin to climb, the program sets a baseline that allows players of all ages and fitness levels to join the fun. Monitors situated above the Tread-wall let friends and family witness the action and share in the excitement. As guests climb the Tread-wall, they begin to scale the side of the virtual building. If the guest maintains the original baseline pace, they will catch Venom at the top of the roof. If they slip off that pace, Venom will climb farther away from the visitor. To complete the experience, Canon EOS Rebel T3is mounted above the Tread-walls capture a specific moment of the guest looking up mid-climb, combining them with an image of Spider-Man climbing the building. An associated backend tag id transmits the image to the gift shop, making it available for purchase.